Bangkok Flight Bookings from £459 at Emirates Take a trip on the Thai side for as low as £459 with Emirates. 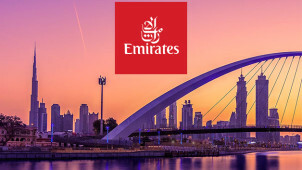 Up to 25% Off Jumeirah Hotels and Resorts at Emirates Put your feet up in a Jumeirah hotel for less with the discounts you can find through Emirates. Perth Flights from £714 at Emirates Sample the sites of the other side of the world from as low as £714 at Emirates! Kuala Lumpur Flight Bookings from £499 at Emirates Take a trip on the Thai side for as low as £459 with Emirates. Up to 20% Off Stays in Atlantis, The Palm Hotels at Emirates Put 20% back in the bank when booking your stay at Atlantis by booking with Emirates today! Dubai Flights from £639 at Emirates Dazzle yourself with Dubai's magnificent architecture and cuisine with a quick and easy flight with Emirates. Cape Town Flights from £572 at Emirates Give yourself a welcome break and grab a ticket to the picturesque African coast of Cape Town today! Sydney to London Flight Bookings from £647 at Emirates Get yourself halfway across the world at a reasonable rate with a quick Emirates booking! Birmingham to Africa Flight Bookings from £429 at Emirates Take a warming trip to somewhere new with a competitively priced flight from Emirates. Whether you're travelling on business, with a friend or family, Emirates can cater to suit your needs. This is the perfect travel provider for those who want to see the world, in style and on budget too. With Emirates you can rely on spectacular service and adventure all the way, with Top Destinations that can be reached from all 142 cities within the Emirates network. Whether you want to fly from Europe or even when you're further afield - let Emirates take you there. Get lost in Angola, Africa, visit Chennai, India, New Zealand and a huge array of other destinations, the world is yours for the taking with Emirates discount codes. For both the Business and leisure traveller, Emirates can keep you flitting around the globe, stress-free and while enjoying that 5-star treatment too. With easy upgrades to First Class and Business Class, every journey can be tailored made to keep you relaxed. Striving to always offer more for its customers, you can even book your hire car, accommodation, plus exciting tours and activities too with Emirates. Browse a selection of luxurious hotels to indulge in, and whether you're headed for a night's stopover in Dubai or 5 nights in Australia, you'll always feel refreshed and invigorated when you stay at a top hotel. Stay inspired with Emirates and let yourself unwind with in-flight excellence like fine dining, mood lighting and more while you anticipate the new experiences that await you when you land. How do I use my Emirates promo code? Continue through to the payment page where all your discounts will be applied. Offers which don’t require a code will be included in your total amount payable. Sign up to receive news, exclusive offers and more with the Emirates Holidays newsletter. How can I check my Emirates cabin baggage allowance? This varies between flights and ticket types, refer to the Help Centre for specific weights and dimensions. Am I able to upgrade my Emirates Flight? Absolutely, if you would like a little First Class luxury, you can log in to your account to upgrade using your Skywards Miles or cash. Can I check-in online for my Emirates flight? You will be able to check in for your flight online, 48 hours before departure. Last online check in is 90 minutes before your flight is due to depart. Email customer.service@booking.com or refer to the Contact Us page for more enquiry options. You will be emailed an electronic ticket for you to print out, with your booking reference. To cancel your booking, you should contact your local Emirates office. When you want to fly away and create memories in a beautiful part of the world, you can count on award-winning holiday provider, Emirates, to take you there. Indulge in a luxury experience and with an Emirates promo code, now you can let the destination experts whisk you away for less. Passionate about holidays to bustling Dubai, South Africa, South East Asia and the glorious Indian Ocean - with Emirates you can count on an enriching experience like no other. Not only do you get the ticket of a lifetime, every time you book with Emirates, but with Skywards Miles, you’ll reap plenty of rewards too. For every GBP spent, you will receive 1 Skywards Mile which when accumulated, will entitle you to many perks such as flight upgrades, fast-track boarding and more when you've booked with your Emirates voucher codes. The more points you earn, the more benefits you’ll enjoy depending on your tier, so don’t wait to join this exclusive frequent flyer programme that’s available for business travellers too. When we want to explore more of places unknown to us, we love to go for a package holiday option and get that all-inclusive luxury experience. With Emirates, it’s easy to book a trip that is tailored to suit your every need, plus with an Emirates discount code, you’ll stay on budget too! Whether you’re looking for a resort in Thailand or Dubai, you’ll be sure to find a hotel that’ll give you that special experience you’re looking for, to make your holiday or business trip away, nothing but a dream.